Occipital Nerve Stimulation is one migraine treatment option available to migraine sufferers. According to the Migraine Research Foundation, migraine is the third most prevalent illness in the world, affecting 28 million men, women, and children in the United States and approximately one billion people worldwide. While there are a variety of different treatments available, they are not always successful for all individuals who suffer from chronic severe headaches and migraine. 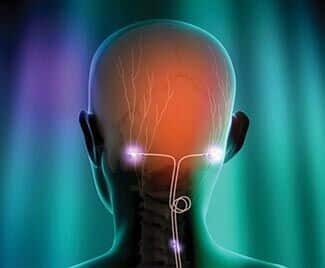 Occipital Nerve Stimulation (ONS) is a type of neurostimulation where a medical device is implanted within the patient that stimulates the spinal cord or nerves using a mild electromagnetic pulse in the effort of easing the pain of the patient. Occipital Nerve Stimulation therapy focuses on treating headaches, migraine, and other types of head pain that occur in the back of the head. This form of treatment is considered when other pain management options have failed to relieve the pain of the patient. This specific type of treatment uses a mild electrical impulse to the greater occipital nerve and the lesser occipital nerve located at the back of the head. This minor surgical procedure involves placement of a lead line under the skin near the greater and lesser occipital nerves. These lead lines are attached to an Implantable Pulse Generator (IPG) under the skin which can be placed in various areas within the body, such as the chest, hip, or back. The decision of Implantable Pulse Generator placement will be determined based on discussions between the patient and the surgeon. An external device, which works like a remote control, is used to program the entire system via radio frequency. The system can be engaged and disengaged as needed by the patient based on their specific pain level. Occipital Nerve Stimulation, developed by Dr. Kenneth L. Reed and his team has been available since the early 1990s. The treatment is FDA-approved for certain types of pain syndromes. While it is not approved for head and facial pain specifically, it is considered as an “off-label” use and is an effective modality for migraine pain. Additionally, neurostimulation for head pain was granted CE Mark approval for use in Europe in September of 2011. Efficacy is different based on the type of headache or migraine, but it can work for a variety of people with head and facial pain. A good candidate for Occipital Nerve Stimulation is a patient that experiences frequent and severe headaches and migraines (at least two per week) and therapies such as medications, nerve blocks, and other modalities have failed to provide pain relief. The first stage of the implantation process is known as a “trial placement.” Lead lines are attached externally to the Implantable Pulse Generator, which is also placed externally, and the patient is provided with a remote to control the pulses to the lead lines. These remain in place for approximately four to seven days. During that time, patients are encouraged to perform activities and eat foods that are considered triggers for a migraine. This is to test the level of relief a patient may receive once the device is permanently implanted. This test will be a major factor in determining if Occipital Nerve Stimulation is a modality that helps to better manage a patient’s migraine pain level. If the trial placement is deemed successful, a surgery of approximately one hour is scheduled for the permanent placement of the IPG and lead lines. A small incision for the lead line insertion is made at the base of the skull. The lead lines are then attached to the IPG subcutaneously in a location determined prior to the surgery. Post-operative care usually lasts one hour. The patient will then work with a medical professional to help gain the necessary understanding to use the remote control to adjust the impulses for optimal pain management. Complete healing time is approximately six weeks. During that time, the patient should avoid rigorous activity, such as mountain biking or contact sports. After the initial six weeks, all activity restrictions are lifted and the patient may return to a normal routine. A common concern for patients is if brain damage or stroke is possible when the lead lines are placed. 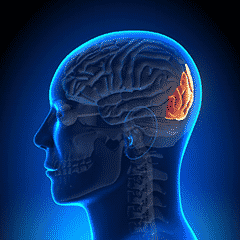 While ONS is placed in the back of the head, it is not placed within the skull or near the brain. The lead lines are placed outside the skull, just below the skin. Therefore, there is absolutely no risk of stroke, brain, or spine damage during or after placement of the ONS device. Another common concern is regarding facial scarring. Because the lead lines are placed via a small incision at the base of the skull, there are no visible facial scars. A small scar at the site of IPG placement will be visible; however, the surgeon can work with the patient to minimize cosmetic scarring concerns. While all surgeries come with risks, they are minimal for the ONS placement. The most common risk is an infection, which occurs 2% – 4% of the time when the placement is done by Reed Migraine Centers, which is well below the national average. Other risks, although rare, include lead migration of the placement site or lead fracture. Most commonly, this type of issue only arises due to a sudden severe trauma, such as a major car accident. On occasion, the battery within the IPG may need to be replaced as it begins to lose charge. This, however, can take several years before a battery replacement is needed. While ONS is a viable option for many migraine sufferers, it is not right for everyone. A patient needs to have a consultation with a physician that is experienced in ONS placement. During the consultation, it is important for the patient to be honest and provide a complete history to the physician in order to determine if ONS could provide pain relief. ONS has a high success rate for many different types of pain, including those who suffer from chronic headaches and migraine. Do you suffer from migraines? Contact Reed Migraine Centers today and find out if the Reed Procedure is right for you. Reed Migraine Centers - Founders and Inventors of the Omega Procedure | Reed Procedure | 4-Lead Procedure | » What is Occipital Nerve Stimulation? What type of insurance do you accept? I am on disability and only have Medicare. I’ve suffered with severe chronic migraines since I was 15 years old and I am 42 years now. This is dire straight for me. I’ve attempted the Botox treatment, which didn’t work for me. Hi. Thank you for your comment and interest in the Reed Procedure. Please contact our office and we can discuss your situation. The office is open 8:30 am to 5:00 pm CST Monday through Friday. The office number is 972.707.2800. Hi and thank you for your interest in Reed Migraine Centers and the Reed Procedure. We accept many private health insurance plans at all of our locations; however, Medicare is accepted only in Dallas, Texas. Please let us know how we can help you. Call our office 972-707-2800 or 214-550-8607. I now get botox shots to my head and have for 2 years but they seem not to be working as well now would you still do this procedure since I have had the botox shots? Yes, the Reed Procedure can be done regardless of other treatment including Botox. Please contact Janet 214-550-8607 for more information. Hi, I had a couple of questions. I live 7 hours away from Dallas. Could the initial consultation with the doctor be done via Skype or something like that, and also would I have to stay in Dallas during the trial period? I have suffered from migraines for 15 years now and am getting desperate. I’ve tried tons of medicines, had nerve blocks and Botox done, and nothing works. My neurologist gave up on me and sent me to a new one. I’m at my wits end. Hi and thank you for your interest in Reed Migraine Centers. I see that you posted this comment in early 2017 so I apologize for just now reading and replying to you. Yes, the initial complementary migraine consultation can be done by phone. Please contact Janet 214-550-8607 for more information. What type of insurance do you accept? I am on disability and only have Medicare / Medicaid combined-Commonwealth Care Alliance. I’ve suffered with severe chronic migraines since I was 15 years old and I am 42 years now. I also have hydrocephalus. I’ve attempted the Botox treatment, injections, occipital nerve blocks, and endless prescriptions, which haven’t worked for me. My life is so very limited and I feel like chronic migraine controls my life. Life is just passing me by. Hi and thank you for your interest in Reed Migraine Centers and the Reed Procedure. Please contact Janet at 214-550-8607 to discuss your specific Medicare and Medicaid plans. I have had migraines for 5 years now and I get the Botox injections in my neck for my migraines every 3 months.But sometimes it helps but sometimes it does not help me at all. I’ve been having migraine headaches since I was 12 years old. Now that I’m 40, it’s been a twenty eight years of hospital trips, and continue meds along with botox. All seem to have failed. Our best candidate for the Reed Procedure is one who has exhausted all conservative treatments. For more information please call our office 972-707-2800. Thank you for your interest in Reed Migraine Centers.